You are cordially invited to make a global impact by joining World Fish Migration Day on the 21st of May 2016! In association with WFMD2016 we want to connect fishes, rivers and people, and to bring migratory species into the spotlight. Migratory fishes represent a primary component of many riverine ecosystems around the world, and are also essential for millions of communities who are dependent on them as a food source. With the help of organisers of local events on one global day we hope to create more global awareness and to achieve a significant impact on fish migration policies, measures and management. As such, we would like to invite you to join in the celebrations by organising an event on World Fish Migration Day 2016! Events can be: river-cleanups, festivals, celebration on a dam/weir removal, inauguration of a fishway or a river restoration project, research activities in the field, special school programs and involving students/citizens, special trainings/workshops, etc. If you are interested you can visit our website and follow us on Facebook (https://www.facebook.com/WorldFishMigrationDay) and Twitter (#WFMD2016, @fishmigration). In 2014 over 1000 different organisations contributed to WFMD2014 with more than 270 events taking place. We hope that this year you can also join in the celebrations. 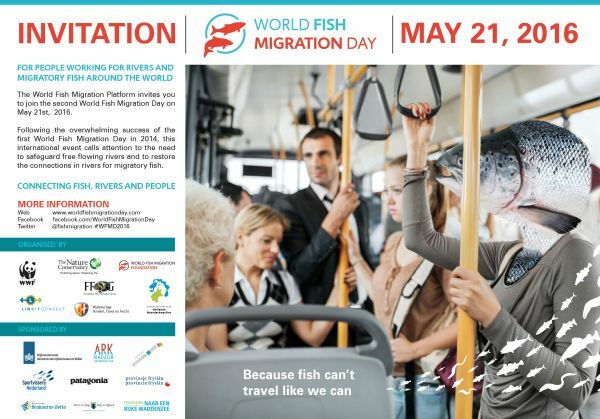 You can register your event directly on the project website http://www.worldfishmigrationday.com/join-wfmd. If you have any questions or would like to get involved, please don’t hesitate to contact Kerry Brink ([email protected]). Also, click here to download the official flyer for this year’s event!